Seattle has had a long baseball history, dating back to the 1890s. Seattle had a Pacific Coast League team beginning in 1903, and the city had teams in either the PCL (1903-1906; 1919-1968) or the Northwestern League (1907-1918) until 1968. Playing under team names like the Indians, Clamdiggers, and Rainiers, the city had many exciting teams and players, including Seattle native Fred Hutchinson, and the PCL version of the Seattle franchise won seven PCL pennants. This would change in 1995. Nevertheless, the Mariners had to really work at it to make the playoffs. They ran down the Angels, who had held a 12½-game lead as late as August 20, by going 26-13 during the last six weeks of the season. They ended the season in a tie with the Angels, then won a one-game division playoff game, 9-1, with Luis Sojo breaking open a tight game in the seventh inning with a bases-clearing double to right field.6 The Mariners were now going to the playoffs! The first two games, played in Yankee Stadium, went to the Yankees, including a 15-inning nail-biter that ended on Jim Leyritz’s two-run home run. 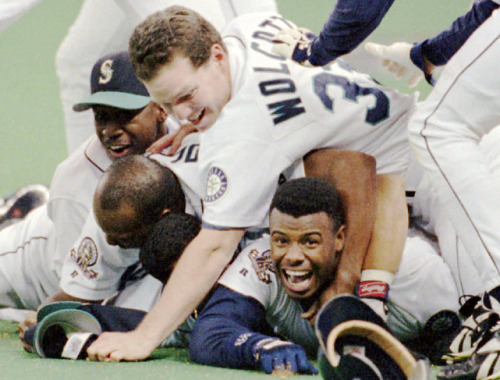 When the series shifted to Seattle’s Kingdome, the Mariners needed a sweep to avoid elimination. They responded to the challenge by winning Games Three and Four, the big blow in Game Four coming on Edgar Martinez’s eighth-inning grand slam, his second home run of the game. This set the stage for a dramatic Game Five. The Kingdome was sold out (57,411), with 78 percent of all western Washington households watching on television. The Yankees were ahead 4-2 in the bottom of the eighth inning, when Griffey made it 4-3 on his fifth home run of the series. Then Yankees pitcher David Cone walked the Mariners’ Doug Strange with the bases loaded to tie the score, 4-4. Norm Charlton, who had pitched the eighth inning for Seattle, started the ninth, and gave up a double and a walk. The formidable Randy Johnson, pitching on one day’s rest, now came into the game for the Mariners with the game (and series) on the line. Johnson’s appearance electrified the Kingdome crowd. He then retired the next three Yankees’ hitters on eight pitches. Mariano Rivera pitched the beginning of the ninth for New York, facing three hitters and retiring one. The Yankees then countered with their own ace, Jack McDowell, also pitching on short rest; he retired the final two Mariners in the ninth and then in the 10th, allowed singles to Jay Buhner and Mike Blowers, before setting down the side.8 No runs scored, and the game remained tied, 4-4. While the Mariners would later fall to the Indians four games to two (after winning Games one and three) in the American League Championship Series, they had put baseball back on the Seattle map. 1 Bob Nightengale, “1994 Strike Most Embarrassing Moment in MLB History,” USA Today. August 11, 2014. Retrieved from usatoday.com/story/sports/mlb/2014/08/11/1994-mlb-strike/13912279/. 2 “Seattle Mariners,” Baseball Almanac, n.d. Retrieved from baseball-almanac.com/teams/mari.shtml. 3 Jim Bouton, Ball Four. 3rd edition (New York: Dell Publishing, 1971). Retrieved from amazon.com/Ball-Four-Jim-Bouton/dp/0440004152/ref=sr_1_3?s=books&ie=UTF8&qid=1418783803&sr=1-3&keywords=ball+four. 4 Andrew Mearns, “New York Yankees vs. Seattle Mariners: Remembering a Once Intense Rivalry. Pinstripealley.com, April 29, 2014. Retrieved from pinstripealley.com/2014/4/29/5665024/yankees-mariners-rivalry-griffey-cone-edgar-justice. 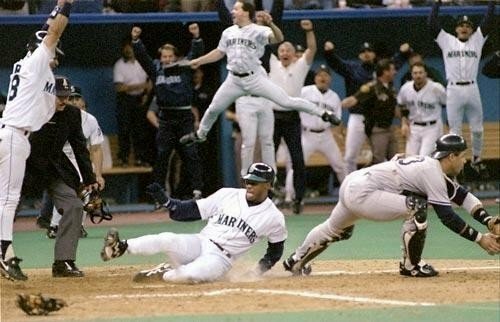 5 Glenn Drosendahl, “The Seattle Mariners Win Their First Playoff Series With a Dramatic Comeback Against the New York Yankees on October 8, 1995,” Historylink.org. September 11, 2011. Retrieved from historylink.org/index.cfm?DisplayPage=output.cfm&file_id=9564. 7 B. Cohen, “1995 ALDS: Seattle Mariners Over New York Yankees, 3 Games to 2,” thebaseballpage.com. Retrieved from thebaseballpage.com/season/1995-alds-seattle-mariners-over-new-york-yankees-3-games-2. 9 Yankees vs. Mariners Box Score. Baseball Reference. October 8, 1995.